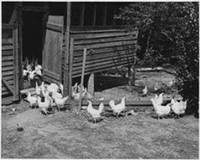 Only known photo of chicken coop. On a cold December morning 58 years ago, a farmer near El Reno, Oklahoma, went out to his chicken coop and discovered someone or “some thing” had ripped the door from its hinges. He saw what appeared to be human-like hand prints on both the door and interior of the coop and assuming some sort of hungry animal was on the prowl, notified the local game warden. The warden measured the prints, which were 7⅝-inches-long and 4⅛-inches-wide, however, he could not identify them, nor the footprints near the coop, so he, in turn, contacted the Oklahoma City Zoo. Zoo director Lawrence Curtis determined the prints – which seemed to have a deformed or injured thumb that crooked inward – were definitely those of a primate. The thumb, he told the Associated Press, resembled that of a gorilla, but was “more like a man,” adding that “whatever was making these prints was walking on all-fours.” Because it was December and humans don’t go barefoot in cold weather – or walk on all-fours – it was decided the culprit was definitely a member of the animal kingdom. Curtis noted there were only three known animals in the state of Oklahoma of sufficient size and strength to rip a sturdy door from its hinges: bears, mountain lions and human beings and a human could simply have opened the door. Additionally, 4⅛ inches would be exceptionally-wide for a human hand. “We’ve shown it to several mammologists and several wildlife experts in Oklahoma and some passing through. All agree it is a primate,” he continued. “These prints were made by some sort of a man, perhaps one looking for chickens.” Other than admitting the culprit was a “man-like creature,” Curtis declined to speculate. Then a clever Associated Press reporter with a flair for the dramatic published an article which began: “There’s something out there. It walks like a gorilla, leaves hand prints like a man, rips doors off their hinges and it likes chickens. For want of a better name, we’ll call him Oklahoma’s Abominable Chicken Man.” The story was picked up by newspapers and reported on radio stations from coast to coast. Suddenly, letters from various parts of the country were arriving at the zoo director’s office. “A tremendous amount of material has cone in,” Curtis said at the time. Many of the communications contained photographs and/or drawings of footprints left by mysterious creatures sighted in other parts of the U.S. People in the Pacific Northwest, where a creature called Bigfoot had been reported, were especially interested. The trouble was, Curtis lamented, all he had of “Chicken Man” were hand prints (above). The footprints hadn’t been preserved. According to Curtis, the most interesting account came from a man in Springdale, Arkansas. “He gave a detailed sighting of three similar animals,” Curtis told journalists. “All of them were hairy and about 6-feet-tall and extremely strong. One of them pushed over a tree.” The writer also alleged cattle in the area had been dying for no apparent reason, implying they were the victims of big, hairy creatures. There were also reports from Oklahomans who had encountered similar prints. 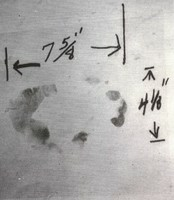 A man in Stillwater (100 miles northeast of El Reno) and a woman in McAlester (150 miles southeast) both claimed to have seen similar prints and the woman mailed Curtis a photo for comparison. Asked about the wide distances between locations reporting such prints, Curtis replied, “If there is one, there is more than one. There has to be more than one unless he’s hitchhiking.” Pausing, he explained, “There are no zoos in El Reno, no circuses and no one known to be keeping a gorilla.” In fact, the only thing in the area that “kept” primates was the federal reformatory – now the Federal Correctional Institution – on the outskirts of town and those primates were human. For years, Curtis – who remained Oklahoma City’s zoo director until 1984 – kept the door of the chicken coop in his office for reference and, one supposes, as a conversation piece. He never identified the primate that tore the door from its hinges. There are still reports of big, hairy man-beasts in Oklahoma, but even after the passage of almost six decades, “Chicken Man” remains a mystery. Sources: Loren Coleman, Cryptomundo, January 11, 2017; The Wichita Falls Times, February 24, 1971; Dennis Montgomery, "Abominable Chicken Man Mystery Still Not Solved," Associated Press; and Jason Offutt, “Encounters with Werewolves,” From the Shadows, September 18, 2009. I read books and websites about cryptids and I've never heard of this case before. I've never heard of it either.